Hey, good morning guys. Matt De Fede with Realty Executives Elite Homes. This is the Nutley Real Estate Report. If you could see the board behind me, basically what’s going on right now is this, and I’m going to explain the opportunity here because a lot of people are worrying about the shift that you hear people talking about. It’s not that bad. I’m going to tell you why in a minute. What we’re looking at right now is a median listing price of about $440,000 in Nutley. That’s the listed price, what the home is listed at, not what the home is sold at. What matters is what price the home is sold at. We’re looking at $440,000 is the average list price when a home goes on the market in Nutley, and the average sold price is right now about $389,000. List price is $440,000, sold price is $389,000. That’s what matters to appraisers is the actual sold price. You’re going to list a home for anything you want and you can have realtors tell you your house is worth millions of dollars, but it’s not going to happen when somebody goes to buy it because the market determines what the price is. Right now the market is determining that median priced home is $389,000. That’s on an average. The other thing that has changed since May of this year is the actual days on market. We’re looking at an average of 60 to 61 days on the market now. That’s two months. In May we were back at 27 days on the market, and yes, this has to do with that shift that’s going on right now and we’re going into a more normal market, and that’s a good thing. The other thing we have to look at is we only have about 200 homes on the market. That’s an opportunity for home sellers right now because demand, supply and demand, demand is pushing the home prices up and that goes for all the surrounding towns as well, Nutley, Belleville, Clifton. The only thing we have to watch is the interest rate. We’re looking at an average interest rate right now about 4.9%. We have a whole generation of people that have not ever seen a 5% interest rate within the last 10 years. They’ve never seen it so they don’t think it’s normal, but it is. What that does do is push down affordability and how much home a person can afford. A point can bring up your payment 100 bucks, 200 bucks, depending on what type of home you’re buying. 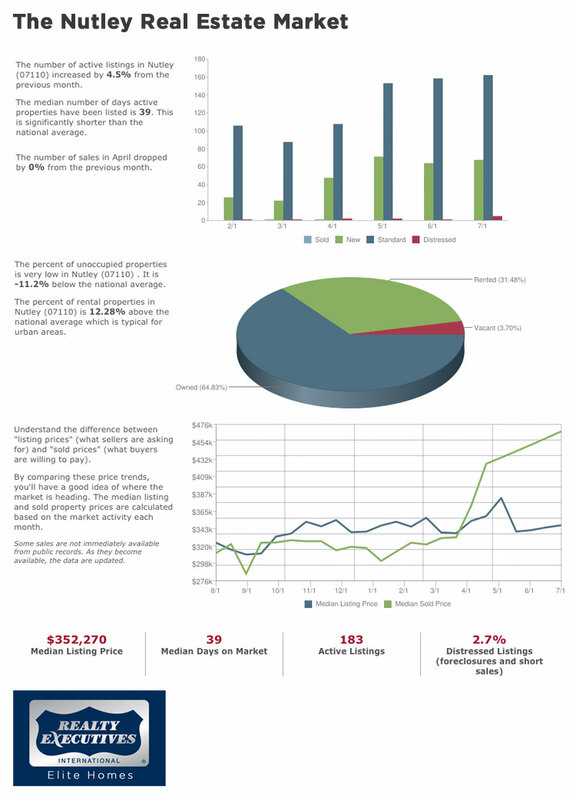 The number of active listings in NUTLEY (07110) increased by 11.1% from the previous month. The median number of days active properties have been listed is 42. This is significantly shorter than the national average. The number of sales in March dropped by 55.6% from the previous month. The percent of unoccupied properties is very low in NUTLEY (07110) . It is -11.24% below the national average. The percent of rental properties in NUTLEY (07110) is 12.34% above the national average which is typical for urban areas. The Nutley Real Estate Market The Roche Campus and more..
What is going on with the Nutley Real Estate Market! The Nutley Real Estate market is hot and homes are moving fast these days! the median price home in Nutley is 370k at the moment and the average days on the market are 59 days. To see more statistics go here. Nutley’s Real Estate market is still pretty robust compared to some neighboring towns, I think in light of all the new developments Nutley as a town is going to change a bit, with the new Medical school going and and the new 600 unit apartment complex going up on Kingsland St. we are going to see a little bit more congestion as well as more demand for property in town.